Give your horse a gorgeous look! Charni Lewis provides step-by-step instructions for 30 mane and tail braids for both casual outings and specialized events of all riding styles. Full-color photographs and detailed illustrations bring every twist and turn to life, while also clearly demonstrating proper hand positioning. 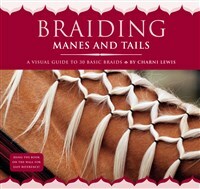 Get inspired and experiment with a Scalloped mane braid or a Four-Strand Weave for the tail. Not only will your horse look great, the time you spend braiding will help develop that special bond between you and your horse. Charni Lewis is a trainer and instructor at Flintridge Riding Club in Pasadena, California. She is the author of Braiding Manes and Tails and has choreographed, produced, and performed in riding exhibitions all over the world. Lewis lives in Altadena, California.